A white metal samovar with two wooden handles and tap, decorated with flowers and scrolling foliage. Body of samovar with rural scenes, harvesting and sheaves of wheat on pierced base with four leaf feet, in pine chest with applied metal plaque . 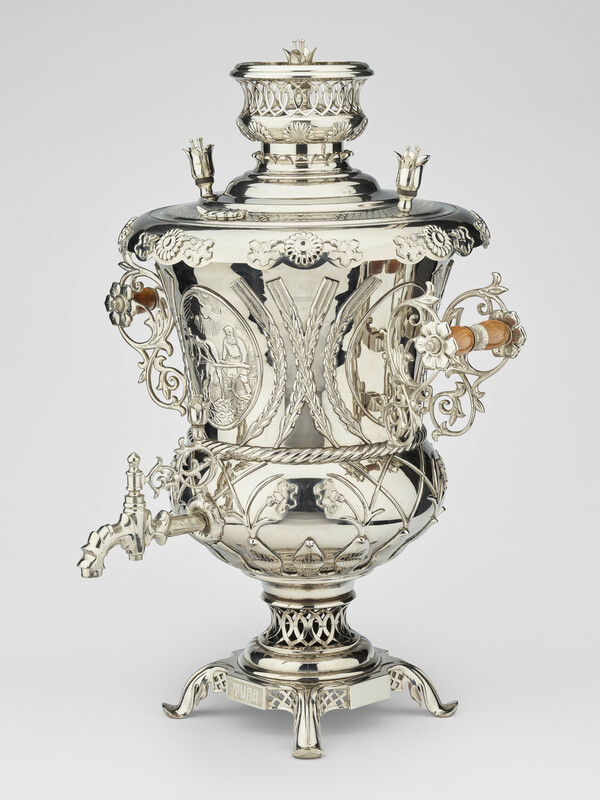 A samovar is a hot water urn, particularly used in Russia but also popular in Western Europe since the nineteenth century. It keeps water hot for making tea and coffee. This particular example was made in the city of Tula, known for its metalwork. The Queen was the first British head of state to stand on Russian soil. Edward VII had previously visited his cousin, Tsar Nicholas II, mooring his royal yacht offshore in 1908. The Queen stayed at the Kremlin during the Visit.